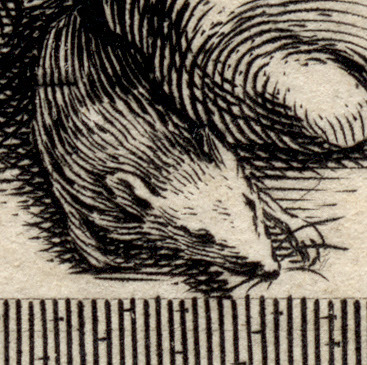 Engraving on fine laid paper unevenly trimmed to the image borderline and with some of the text line cut off. Provenance: Library of the late Marianne C. Gourary and previously with Christopher Mendez (his note on mount states: “probably Hollstein 320”). This is an exceptionally rare print that is not held in the British Museum and undoubtedly an early impression (lifetime) as the print quality is simply superb. 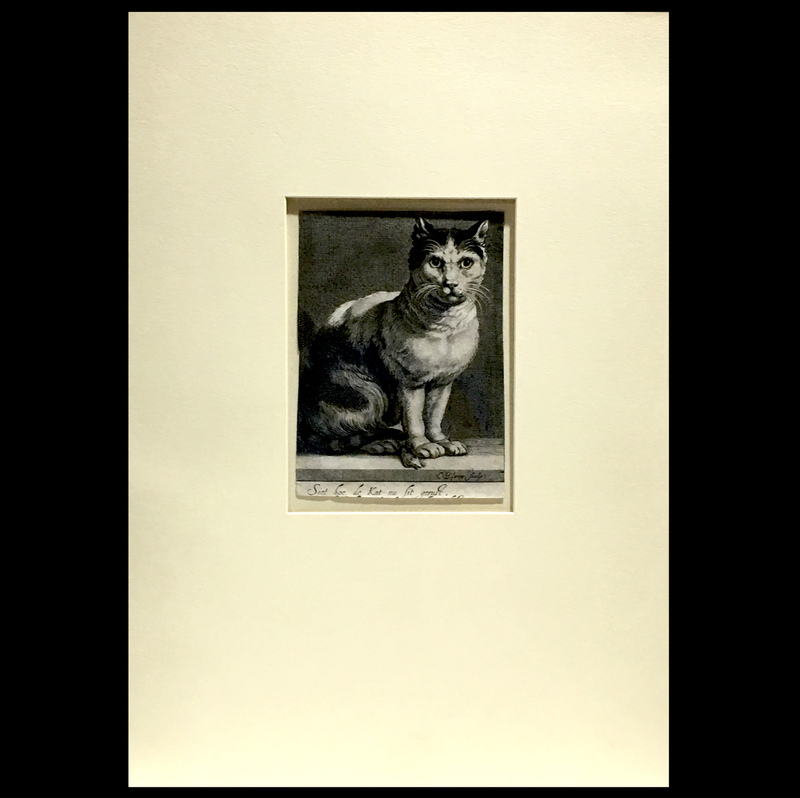 Condition: strong, richly inked, well-printed impression trimmed to the image borderline and with the text line cut. The sheet is in faultless/pristine condition (i.e. there are no tears, holes, abrasions, stains, folds or foxing). 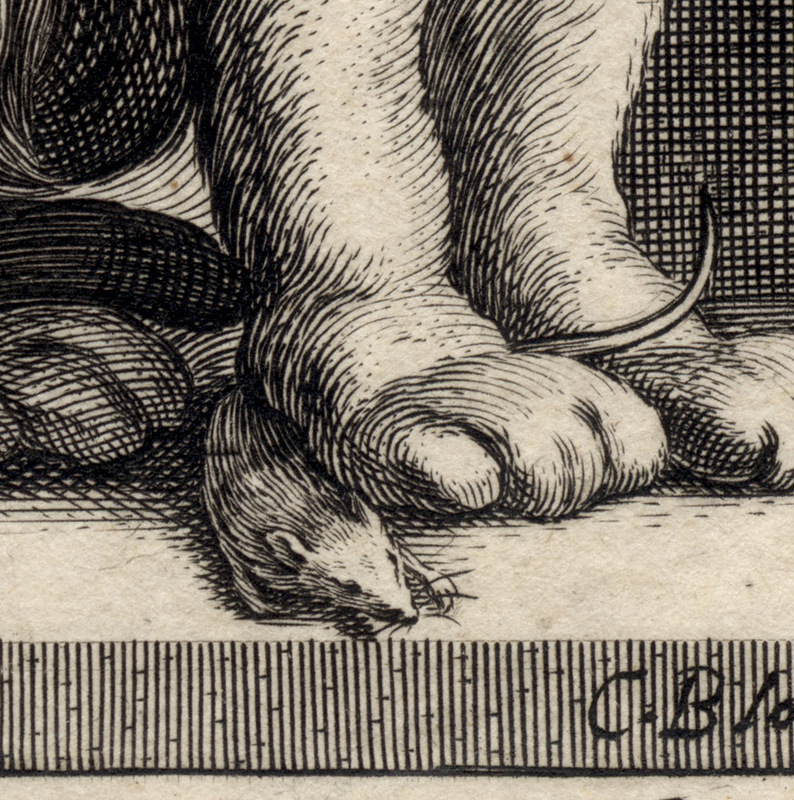 I am selling this rare 17th century engraving of a cat and its mouse for AU$409 in total (currently US$304.68/EUR287.69/GBP245.73 at the time of posting this listing) including postage and handling to anywhere in the world. 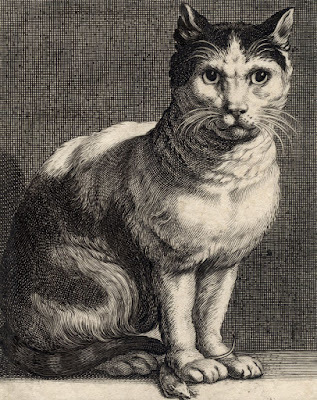 If you are interested in purchasing this startlingly real depiction of a cat who has brought its owner a surprise treat in the form of a tiny mouse, please contact me (oz_jim@printsandprinciples.com) and I will send you a PayPal invoice to make the payment easy. 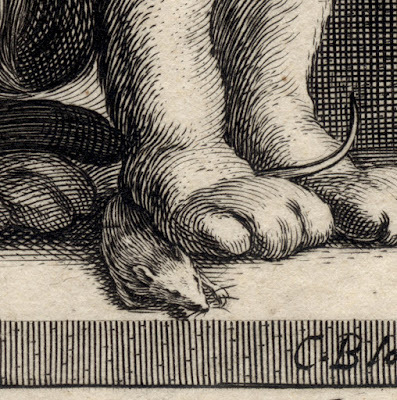 This is one of the minor miracles of 17th century engraving. 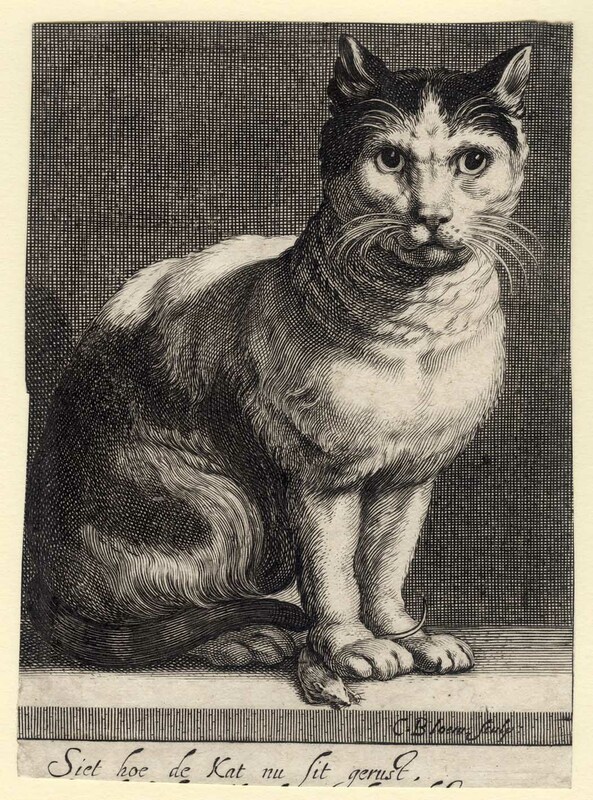 What makes it stand out from the many other remarkably well-executed engravings is how well the engraver, Cornelis Bloemaert (son of the great master, Abraham Bloemaert) expresses the form of the portrayed cat as solid but softly muscled. 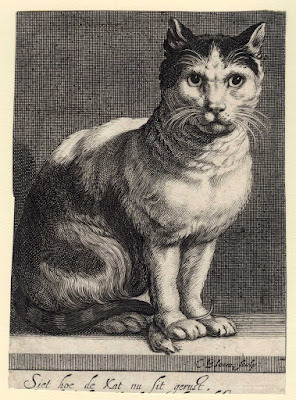 For example, whereas a lesser artist may have rendered the whole cat in minuscule curved strokes as a way of representing the cat’s fur, Bloemaert has not laid any strokes at all on those areas of the cat that are in full light and has refrained from using memetic curved hair-like strokes in the shadows. The only places where the artist has used marks designed to replicate the individual hairs is on the half-lights. 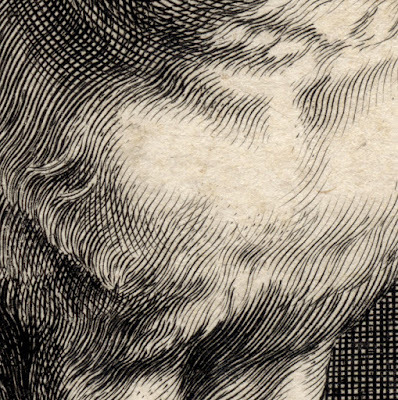 Another indicator that this is a well-thought out drawing, is the use of white lines (i.e. 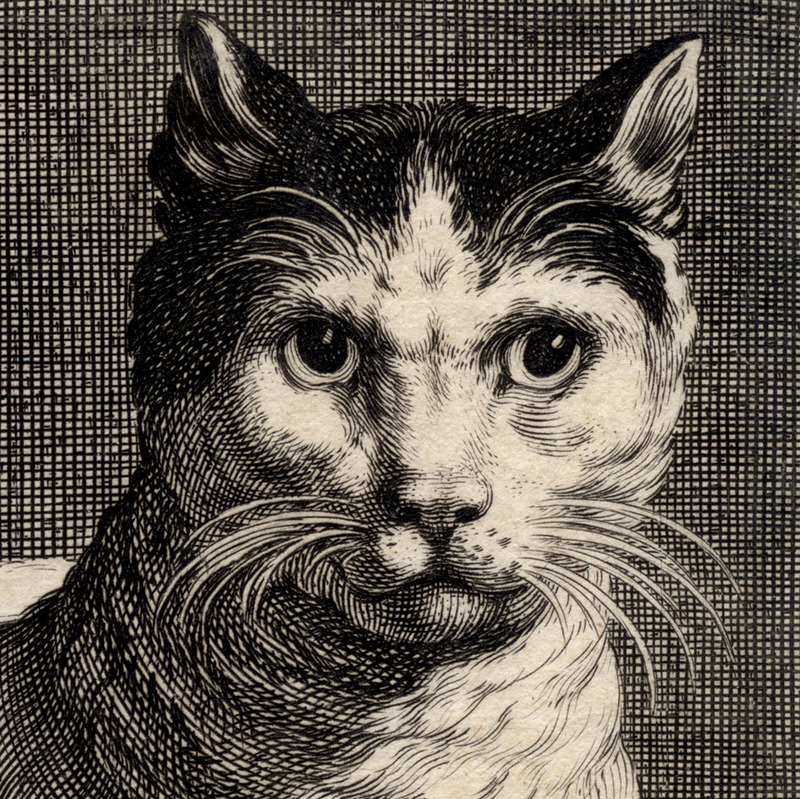 “fake” lines where the line work in the background creates the effect of a white line simply by the absence of drawing a line at all) designed to represent the cat’s whiskers. In short, there is so much knowledge, insight and subtlety shown in this engraving that the end result is that this print is not a collection of lines—it is a living cat that has a cat’s ability to command attention and to be noticed!